Hey you, get your damn hands on this! The first episode of Back to the Future: The Game (GC’s future Game of the Year 2011) is now available for free on PSN! I’d bust out the celebratory-cat jpg, but I think I’m over my quota for the month already. If you’re not interested in the … Continue reading "Back to the Future: Episode 1 Free on PSN!" Hey you, get your damn hands on this! 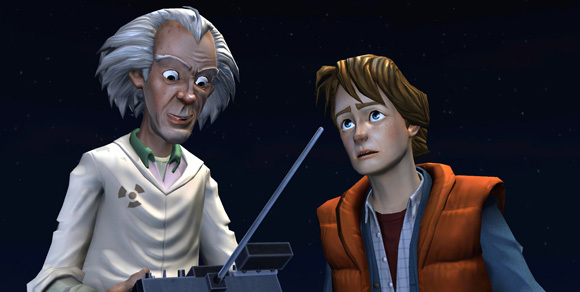 The first episode of Back to the Future: The Game (GC’s future Game of the Year 2011) is now available for free on PSN! I’d bust out the celebratory-cat jpg, but I think I’m over my quota for the month already. If you’re not interested in the puzzles, or the yucks, or the enormous rocket-powered drill, let’s not forget: free Trophies. (Heck, you could even make it a night of free trophy-hunting, since, last time I checked, the first episode of the children’s murder-mystery game The Blue Toad Murder Files is free, too.) For more on how much you’re going to love this game, check out Nikola and Michael’s reviews. Fun times in a dilapidated theater!